Halobacterium salinarum is a halophilic archaeon found where sodium chloride concentrations reach 4.3 M, or seven times the concentration of seawater (Oren, 2006). Halobacterium salinarum is considered a polyextremophile, given its ability to also survive high levels of solar radiation and temperature stress such as is found in Qarhan Salt Lake (Xie et al., 2017). Many species of halophilic archaea, including Halobacterium salinarum, produce photosensory proteins which aid in phototactic movement. 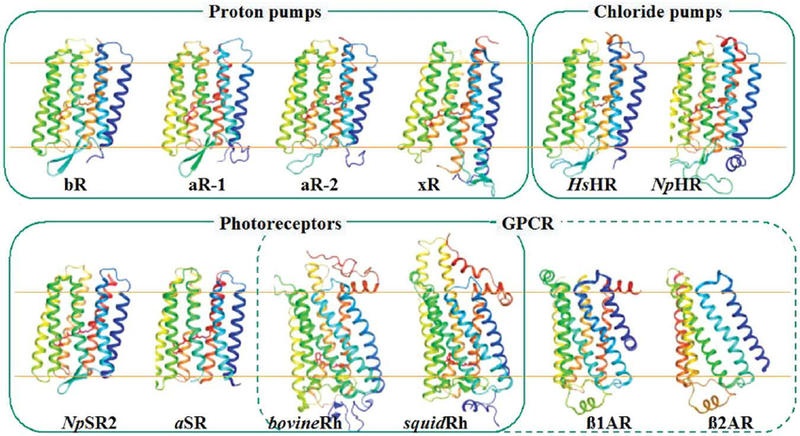 A close homolog of these sensory rhodopsins is the photon-driven proton pump bacteriorhodopsin. is abbreviated bR in the figure (pictured above). The sensory rhodopsin from anabaena, another unicellular organism, is abbreviated as aSR. Bacteriorhodopsin pumps protons into the extracellular space in order to generate proton motive force (PMF). PMF is essential for both ATP production and mitigation of pH stress. Bacteriorhodopsin is a and is the best-understood ion pump. It is the structural prototype of G protein-coupled receptors that contain transmembrane α-helices. Each in the trimer has seven membrane-spanning The polypeptide is color-coded from N-terminus to C-terminus . The monomer is extensively stabilized by 31 hydrogen bonds. Of these 31 contacts, can be ascribed to side-chain/main-chain and side-chain/side-chain hydrogen bonds between neighboring helices. These hydrogen bonds contribute to the stability of the barrel-shaped biological unit. In addition, there are hydrogen bonds between non-neighboring helices, and these account for the remaining 12 contacts. Taken together, the stability from the hydrogen bonds allows each monomer to function as an independent proton pump, even before formation of quaternary structure. The units are held in the rigid purple membrane lattice. Squalene is the most hydrophobic membrane lipid, and is thought to modulate an electrostatic repulsion between the nearby charged Aspartic acid residues of the cytoplasmic loop region and the membrane surface of the inner trimer space. This repulsion helps induce mobility in the α-helices to better accomodate isomerization of retinal and therefore increases the speed of the photocycle (Hendler et al., 2003). See " IV. Retinal Binding" below for more information. When the retinal molecule absorbs the energy of a photon given off by the sun, the C13=C14 double bond isomerizes from trans to cis. The trimer contains three retinal binding pockets, allowing multiple retinal molecules to capture photons in the assembled protein. Electrostatic interactions between retinal and the binding pocket are depicted. 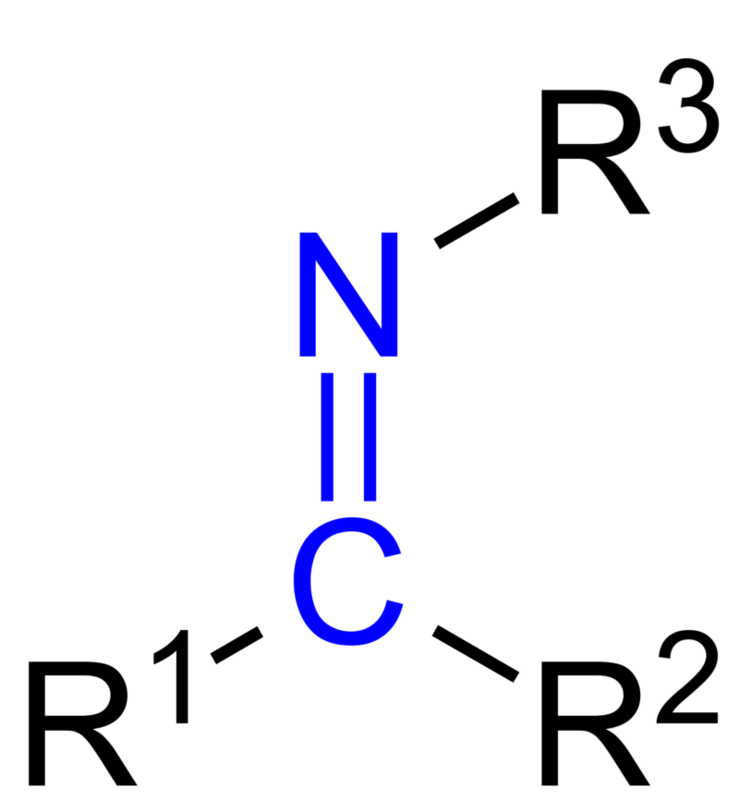 As mentioned before, the 15th carbon of the retinal molecule forms a double bond with the Nitrogen in the sidechain of This linkage is called a Schiff base. A Schiff base is an imine with 3 R groups where R3 must be an alkyl or an aryl group, and R1 and R2 may not be hydrogens. The Schiff base of the retinal molecule is mainly comprised of the covalent link between Lys216 and the chromophore. It is formed by the nucleophilic attack of the amine nitrogen of Lys216 on the carbonyl carbon of retinal. This linking of retinal to the binding pocket via Lys216 anchors retinal in place as it undergoes photoisomerization upon absorption of a photon. There is an extensive that stabilizes separated charges around the active site composed of the retinal Schiff base, Asp85, Asp212, and waters 401, 402, 406, and 407. Photoisomerization results in release of a proton which is then preferentially accepted by Asp85. Another potential proton acceptor, Asp212, is stabilized in its anionic form by with two sterically hindered Tyr residues, and thus is less likely to accept a proton. Protonation of Asp85 releases a proton from a holding site into the extracellular space. The is comprised of waters 403, 404, and 405, and glutamate 194 and 204. The holding site is shielded from the extracellular aqueous environment by Ile78 and Leu201. Asp96 restores retinal to its original isomeric trans form by reprotonation, leading to release of a second proton to the extracellular space. Asp85 releases the proton it accepted from isomerized retinal into the holding site so the process can begin again. This means that for each cycle of trans-cis-trans retinal , two protons are transported to the extracellular space.